Strategies that signal people to take their medicine, such as visual and auditory cues, may help with compliance. (CNN) -- If you have problems remembering to take your meds -- or whether you've taken them already -- some high-tech products on the horizon may be able to help you. Companies are using wireless technology, the same mechanism by which you use a cell phone or the Internet, to develop devices that monitor whether you took your pills as the doctor ordered, beaming information back to you, your doctor or a designated family member. In some cases, this requires swallowing a microchip about as thin as a few human hairs. The concept may sound invasive, but it has the potential to save as much as $290 billion annually in increased medical costs. That amount is lost every year because of people not taking medications as prescribed, according to the New England Healthcare Institute. Drug adherence is only 50 percent among people with chronic illnesses in developed countries, and in developing nations it is probably lower, according to the World Health Organization. 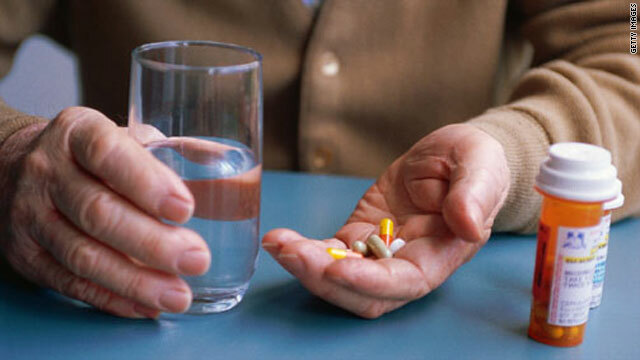 "The magnitude of poor medication adherence, sometimes labeled 'America's other drug problem,' justifies development of technologies that may improve important health outcomes," said Vicki Conn, associate dean at the University of Missouri School of Nursing, in an e-mail. One innovation involves a pill that, once ingested, wirelessly transmits information about side effects and how well it's working. The product with the most recent buzz in this arena is being developed by Proteus Biomedical, a California-based start-up. Novartis AG recently invested $24 million in Proteus to secure licenses and options on the company's drug-delivery technologies. Here's how it works: The patient swallows a pill that contains both medicine and an ultra-tiny sensor chip. This sensor is made of food and vitamin materials, in very small, safe quantities, said Proteus CEO Andrew Thompson. These materials get activated by the patient's stomach acid, essentially making the human body a battery, he said. Then, the chip sends a signal to a waterproof skin patch, akin to a bandage that the person wears. The patch picks up data about heart rate, body angle, temperature, sleep, and other parameters. If the patient comes within 20 feet of his or her phone, the encrypted data are sent to Proteus, which processes it and sends it back in a readable form to a cell phone or e-mail account. Although this has implications for how doctors treat patients, the focus is on the patients themselves and their families taking care of them, he said. The information that the pill picks up gets shared only with the patient's permission, he said. Proteus is working with large technology companies on the privacy aspect of the device, he said. The pill is in clinical trials for heart disease, hypertension, and tuberculosis patients, and will begin testing in psychiatric illnesses also, Thompson said. The product should be on the market by late 2011, Thompson said. That deadline could realistically be met for one of the conditions the pill is being tested for, especially because of support from Novartis, which has a track record of organizing definitive trials, said Dr. Eric Topol, chief medical officer of the West Wireless Health Institute, a nonprofit organization that tracks the wireless health industry. "With many illnesses such as oncology and transplantation, compliance is a major issue, with an immediate cost to the system. From that perspective in terms of outcomes, the value of this kind of technology is clear," said Joe Jimenez, CEO of Novartis. Wireless health solutions are a hot area of development when it comes to delivering medication, monitoring physical parameters such as blood pressure, and taking and sending images from inside the human body, Topol said. "It's where there's more going on in innovation in medicine than perhaps any other area," he said. Other companies are also looking into microchip-driven wireless medication devices. MicroCHIPS Inc. in Bedford, Massachusetts, is developing devices such as a long-term implanted glucose monitor that delivers wireless measurements for diabetics. There is also the Philips' iPill, a drug delivery system that sends information about health parameters to an external control unit. There are also wireless monitoring innovations that don't involve ingesting. The GlowCap, made by Cambridge, Massachusetts-based Vitality Inc., helps people remember to take their medication. The GlowCap is packaging for your pill bottle that flashes orange when it's time to take your medication, then plays a melody if you haven't taken your medicine within an hour. It comes with a nightlight that communicates wirelessly with the cap, and also turns orange at pill time. Vitality sends you -- and anyone else you want to know about it -- a report with how well you stuck to your medication regimen. Those who forget to take their medicines despite the reminder from the GlowCap will receive a call or text message after a few hours. The product is being sold on Amazon.com for $99, but the makers envision it as a free add-on to pills distributed at pharmacies, said Joshua Wachman, president of Vitality. The company has implemented the technology with a transplant drug, a diabetes drug and a hypertension drug, Wachman said. The GlowCap relates to the finding of Conn's group's research that strategies that signal people to take their medicine, such as visual and auditory cues, may help with compliance. "The devices that provide feedback about the effectiveness of medications, such as physical changes in the body in response to medications, are also likely to be successful."